Fresh from their phenomenal run on TV3’s Ireland’s Got Talent, the young musicians and dancers of Atlantic Rhythm have already made inroads into their next challenge – taking the West of Ireland by storm and captivating tourists with their brand new original Irish music and dance show, Tradbeats which premiered in Ballina Arts Centre, Co. Mayo on Tuesday, July 17. Features the seven musicians and eight dancers lauded as “the next Riverdance” in their recent television run. Entirely written and choreographed by the talented young group, the show draws its themes from the Wild Atlantic Way on which they have all been born and reared, and represents a fusion of all the traditional arts in an uplifting, raw music and dance experience. Gone are the rigid hands and the wigs traditionally associated with Irish dancing, in their place is a release of a wonderful rawness of mixed step and exhilarating sean nós dancing featuring traditional brooms and barrels, alongside powerful percussion pieces where the shoes do the talking. Between them, the dancers hold 10 World Champion titles with six of the dancers currently placed in the Top 8 in the world. Equally talented are the musicians, with numerous Fleadh titles to their credit. They provide a unique accompaniment to the dancers with intermittent uplifting music pieces to get every hand clapping. The new show also features original new tunes composed from entirely within the cast. Importantly, the show also offers visitors to Co. Mayo, particularly of the overseas variety a unique and professionally produced Irish music and dance, experience, comparable with anything offered at a professional level in destinations like Killarney. The group hopes to stage the show on an ongoing basis in 2019 and beyond – but this is dependent on the support of the local hospitality industry, in particular accommodation providers. Together this energetic and accomplished group have been recognised on RTÉs Late Late Toy Show, and ‘The Ray D’Arcy Show’, TV3’s ‘6 o’Clock Show’, TG4’s ‘An Jig Gig’ and ‘An Ríl Deal’! They have also performed throughout Ireland, in the USA and the UK to tremendous acclaim. 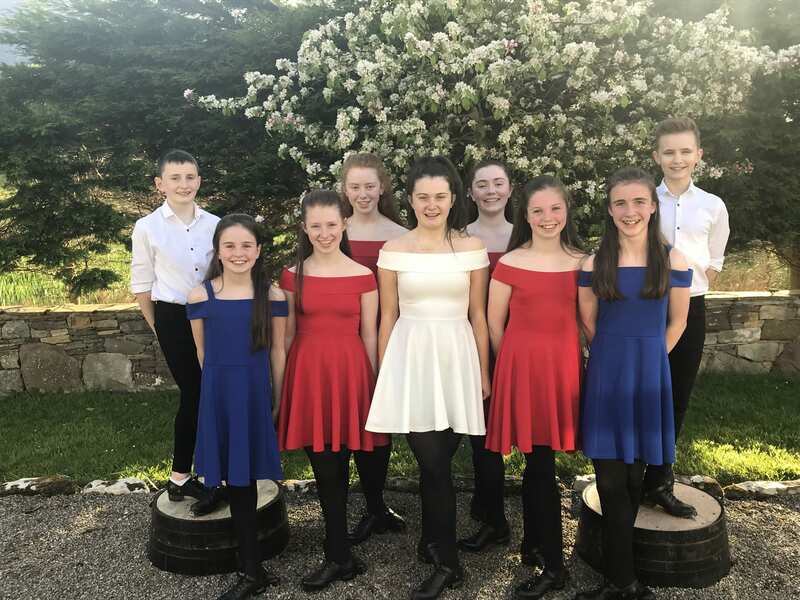 The 15 young performers will be accompanied by some of their friends to give a full cast of just over 20, hailing from the North Mayo region encompassing Crossmolina, Belmullet, Knockmore, Attymass, Lahardane, Newport and Tubbercurry. 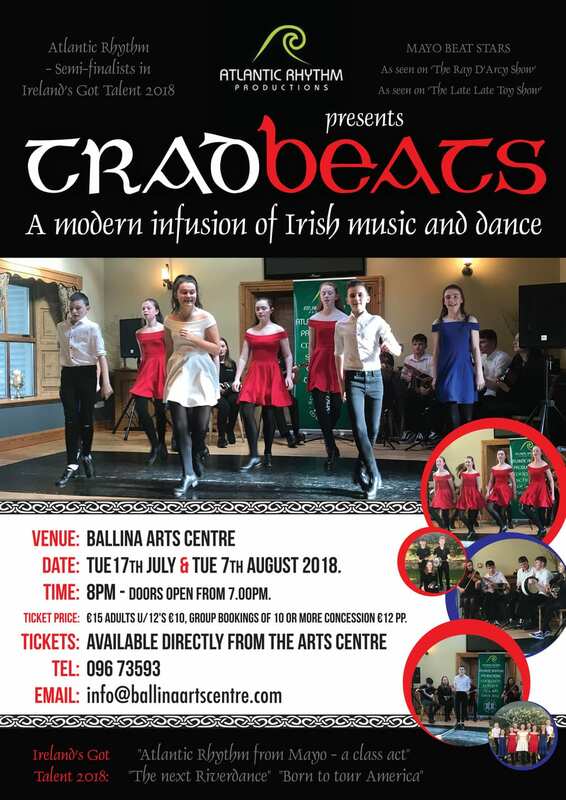 Tradbeats will be performed by Atlantic Rhythm in Ballina Arts Centre on Tuesday, August 7 at 8pm. Doors open from 7pm. Tickets on sale now – contact the Ballina Arts Centre Box Office on 096 73593 or email info@ballinaartscentre.com.